The first kind of SUFFERING is the obvious suffering caused by physical discomfort, from the minor pain of stubbing a toe, hunger, and lack of sleep, to the agony of chronic disease. It is also the emotional suffering that arises when you become frustrated that things don’t go your way, or upset about life’s injustices, or worried about money or meeting others’ expectations. Furthermore, every day, even during the pleasant moments, do you not experience an underlying unease about the future? This worry and anxiety is a manifestation of the third type of suffering the Buddha identified—life’s inherent unsatisfactoriness due to its intrinsic instability. Whenever there is pain of any kind—the pain of aggression, grieving, loss, irritation, resentment, jealousy, indigestion, physical pain—if you really look into that, you can find out for yourself that behind the pain there is always something we are attached to. There is always something we’re holding on to. 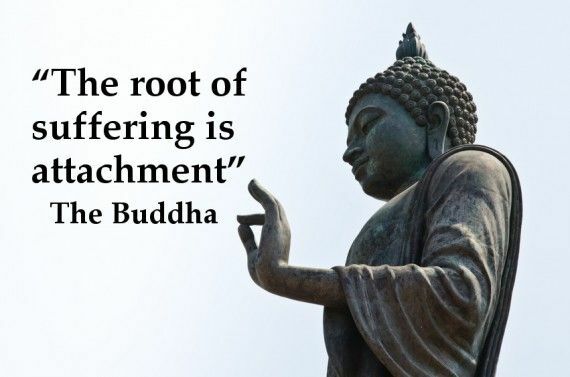 You can read about it: the first thing the Buddha ever taught was the truth that suffering comes from attachment.